The Society for Photographing Relics of Old London was created to record London's historic buildings, many of which were demolished in the Victorian period. 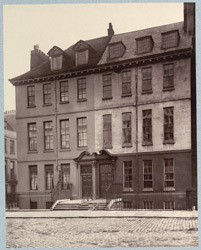 None of the original buildings in Queen Square have survived. It is "clear from the arrangement of the windows that the house must originally have been built as we now see it; it cannot have been afterwards divided into two," writes Alfred Marks in his letterpress accompanying Henry Dixon's photograph from the book 'Photographs of Old London'.